Have you ever wondered why a car’s review mirror is about 1/100th the size of the front window? We use the rear view mirror to check occasionally, to make sure nothing is close to us that might cause us harm, but our focus is always looking to the front when we are driving. If we drove looking in that rear view mirror, we would crash very quickly. But I have found, that is how we go through life sometimes. Focusing on what is behind us, instead of what is ahead. And we CRASH. BOOM!! I spent 20 years of my life, focused on all the bad things of my past, instead of looking ahead to the promises that God had for me. And I crashed. Down I went into a spiral of negative emotions; shame, guilt and despair. And those emotions almost destroyed me. But one day, I turned my focus around. Instead of the past, I looked forward, towards Jesus. And His great love changed everything. I saw myself the way He saw me and everything changed. I no longer listened to the lies of the enemy, but believed the voice of truth. I want to encourage you today, if your focus is behind you, it’s time to turn forward, towards Jesus. There is now no condemnation to those who are in Him! Will you believe and receive His Love for you? 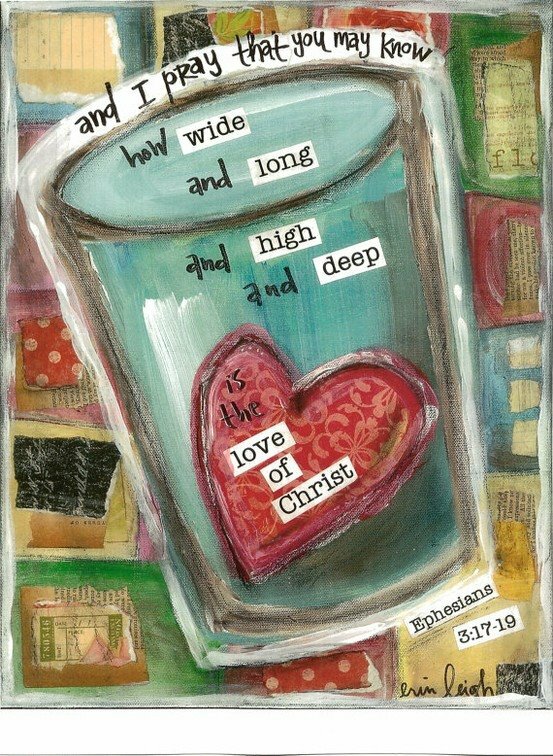 Will you allow His Love to fill you to the measure? This entry was posted in Devotional, Encouragement and tagged Ephesians 3: 17-19, Extreme Love, How He Loves Us. Bookmark the permalink.